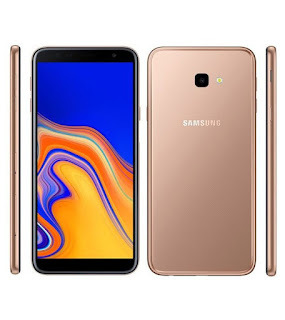 Being the lesser part of a new release, the Samsung Galaxy J4 Pro is a budget smartphone with a handful of features. This is not a feature packed phone just the kind of smartphone a first time user would like. The entry level smartphone has a single camera as opposed to the dual rear arrangement on the Galaxy J4 Plus. However, it still maintains the glassy appearance has seen on the more premium release. Although not quite the fancy phone, the Samsung Galaxy J4 Plus still has a neat simple design. The rear cover is mostly plain except for the centered camera and Samsung branding. On the other side, the front of the smartphone is very similar to that of the J6 Plus despite missing the fingerprint reader at the side. There is a black, pink and gold colour option to chose from just like the J6 Plus. The display on the smartphone is a typical budget feature and it has some points for being a bit large since that’s the way smartphones are headed this days. You could enjoy the 6.0-inch infinity display space by watching movies but don’t expect best of quality. There are reduced bezels around the display and it has an HD+ resolution lighting up the screen. Not much to write about here, as it is the same as on the J6 Plus and quite frankly an average capacity. As far as your usage stays within the average line you can enjoy a day’s worth of time on the device with the 3, 300mAh battery on board. Optics on the smartphones is quite okay, even if the dual arrangement have been stripped away leaving one camera at the back. The single 13MP camera has a f/1.9 aperture and can’t take top class pictures but you will have to make do. Same goes for the 5MP camera at the front with f/2.2 aperture. Also running on the same set of chipset as the Galaxy J6 Plus which you can’t really do.much with. Nonetheless ,the quad-core Qualcomm Snapdragon 425 processor and Adreno 308 handles basic tasks quite well. In addition, you also have 2GB RAM on the smartphones alongside 32GB built-in storage space. Maximum storage expansion level is set at 512GB and it also has Android 8.1 running on it. You can get the smartphone at around 55, 000 Naira depending on the deal and your location.